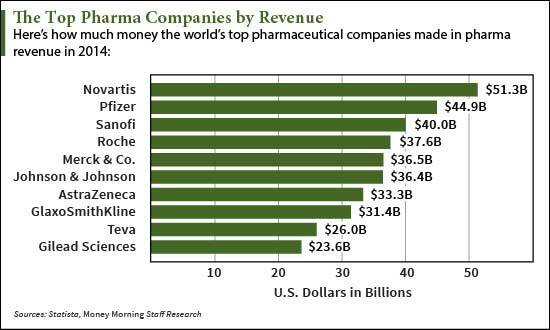 This chart shows the revenue generated by pharmaceuticals alone. For example, Johnson and Johnson (NYSE: JNJ) total sales were $74.3 billion in 2014 for the entire company. Pharmaceuticals accounted for $36.4 billion of that total according to the research firm Statista. The list of pharmaceutical companies is topped by Novartis AG (NYSE: NVS), which had more than $51 billion in pharmaceutical revenue in 2014. The $274 billion company's biggest revenue generator is the cancer drug Glivec. In 2014 it had more than $4.7 billion in sales. Novartis had three other drugs that brought in at least $2 billion: Gilenya, Lucnetis, and Diovan. Pfizer Inc. (NYSE: PFE) is next on the list with pharma revenue near $45 billion annually. Its drug Lyrica, which treats diabetic peripheral neuropathy, is the company's biggest revenue generator with $5.1 billion in 2014. Third on the list of pharmaceutical companies is Sanofi SA (NYSE: SNY) whose own diabetes treatment Lantus brought in $6.3 billion in 2014. Now, Money Morning's Defense and Tech Specialist Michael Robinson has found the best way to profit from the absolutely booming pharmaceutical industry. In 2015, Robinson's pick has gained 10.3% while the Dow has gained just 1.4%. Over the last 12 months, the play is up 24.9% compared to 8.1% for the Dow. And the best part about the investment is that it's a play on the pharmaceutical industry's $166 billion M&A trend of 2015. You see, with all the cash these companies generate, they are able to easily scoop up other competitors or rising companies.